It seem simple enough, I actually really struggled not putting on a third circle! LOL I think I pulled it off though. Here is a close up of one of those gorgeous wood veneer snowflakes. All I did with those is poked them into the White craft ink to colour then tapped it into Dazzling Diamonds glitter. So easy, yet very effective. 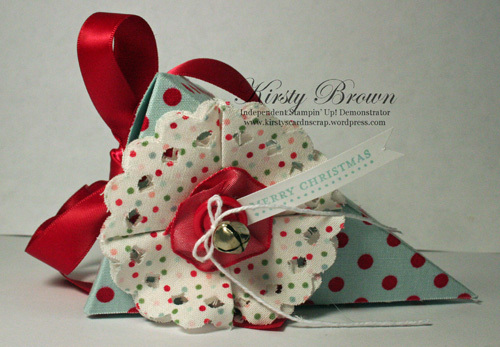 Don’t forget to check out the others gorgeous creations. You came from Alisa’s blog and you will go onto Tamsin Adams. I have been playing with my new goodies again. 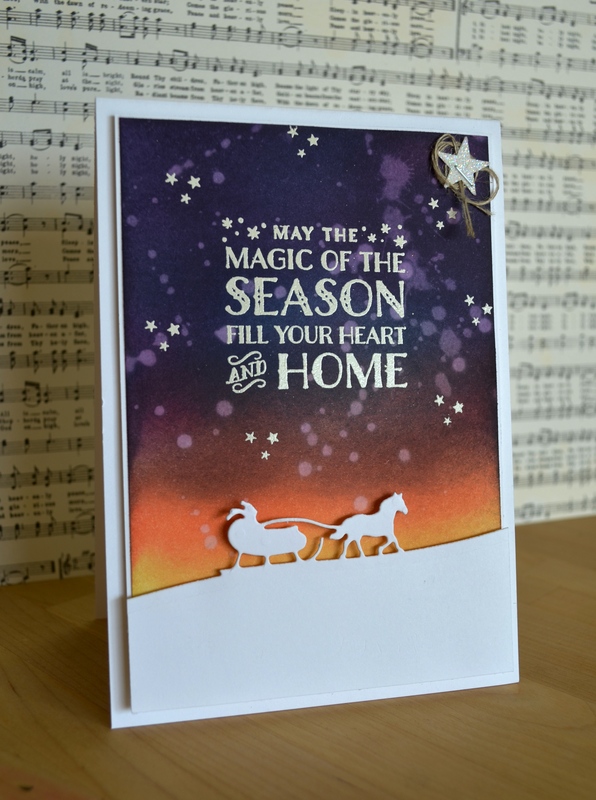 Jingle All the Way is very fast becoming a favourite as it gives a great opportunity to create beautiful night skies. 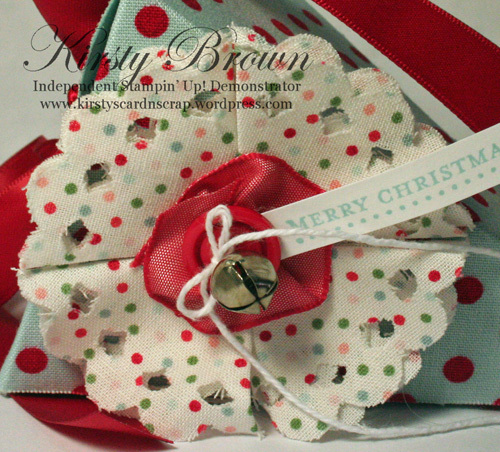 With this particular design I found a card that Billie Moan made and I loved it. She had a colour combo for her night sky that I haven’t played with before and decided to CASE her card. I do love how it turned out except for that dreaded smudge. You know the one that shows up just as the final piece of the card is put together?! Ughh! I hate that! But I wasn’t going to create it again. LOL! Now my starry night is a little different to Billies’ where I stamped the Gorgeous Grunge in White Stampin’ Craft Ink, got a tissue and wiped it in one direction then came back and stamped the white again, but this time I did not smudge it. It reminds me slightly of those blurred night sky photos I see a lot of, and I suppose very lose to the Bokeh technique……which in fact I have made a Bokeh Technique card, I just cannot find it. I suppose that means I have to make another. P.S. Again the Stamp and Die set are not listed below as they are not available yet. Not long now!! 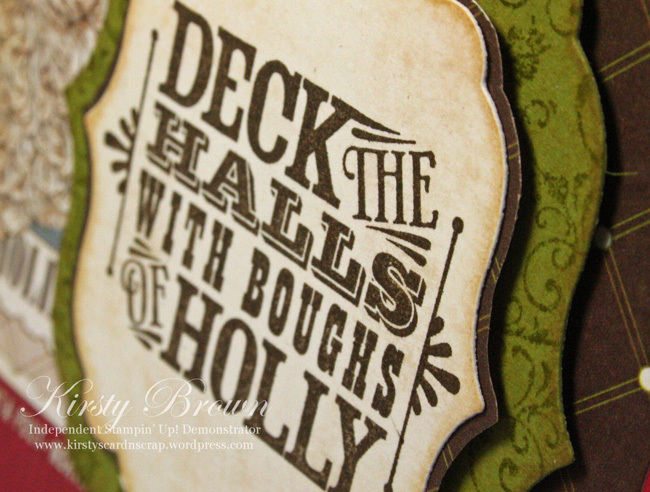 Very soon, in just 10 short days, we have our Holiday Catalogue going live. 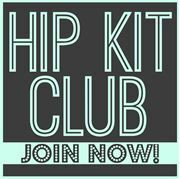 I have a creation with some of those goodies to share. I used a technique I have seen a lot lately and I love how it turned out and you will laugh when you realise how easy it is….not too mention you have probably accidentally done it before and thought “Well that’s ruined”, because I know I have. LOL! See those splotches in the ink? Well that’s just plain old water. Now I will have to back up a few steps first as I am sure a lot of you will want to know what colours I used for my evening sky. I started down the bottom with So Saffron and I sponged it on quite liberally, then Calypso Coral, be careful to leave a little Saffron showing. I did go over again with the Saffron to blend the two together better. These two coulees were only put on the bottom. I then sponged Perfect Plum over the rest of the card stock and blended that with the Calypso as best I could. I then splotched Bermuda Bay and Island Indigo over the purple. I finished it off with Blackberry Bliss and Night of Navy last to get that deep night sky. It’s my first attempt and I am sure I will find more colours to add or swap some out for different depths and tones. 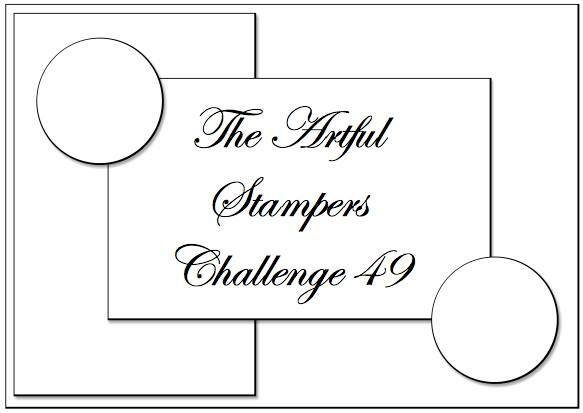 So now the sponging is done, grab your Stampin’ Up! Aqua Painter, make sure the reservoir near the tip is full of water and flick it over your night sky. Stop and mop up the water with a tissue and repeat (This is what I was talking about in regards to stuffing past cards up by accidentally wetting them!! haha). I found the longer I left the water on the whiter the spots. I did ones that were left on for 10 seconds and some left on for 2. It gave me quite a few different tones. Now you could have done the emboss resist technique with this, but I think the water droplets would have turned out differently. I covered it liberally with the Embossing Buddy as you could imagine this piece of paper is quite wet being full of ink and water. I am sure a zap with the heat tool would help too. 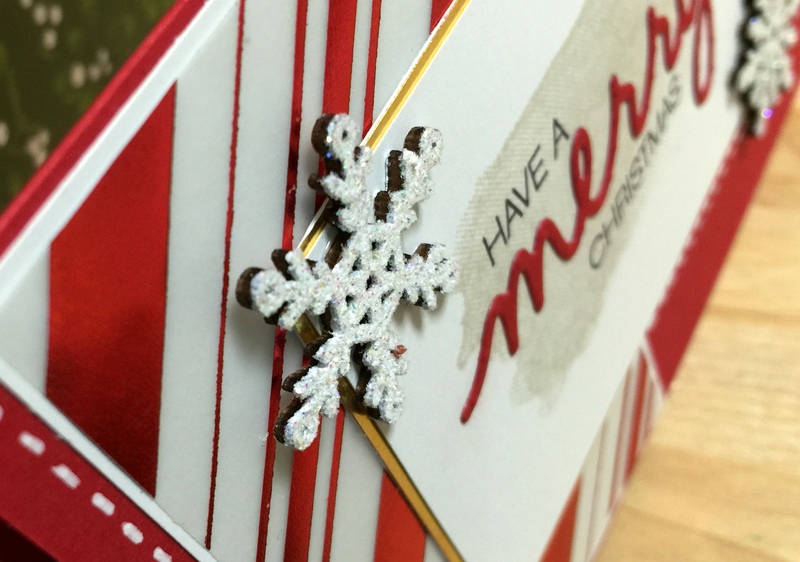 Using the Versa Mark I stamped the sentiment and stars and used white embossing powder. I nearly used gold but on a scrap of paper it was too dark. Silver might be nice though. I then added the die cut along the bottom on Dimensionals to have that beautiful shadow effect. If you do CASE it please let me know in the comments with a link so I can check out your creation. P.S. 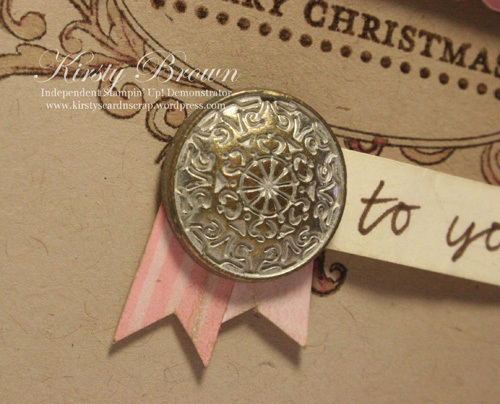 The Stamp Set and Die cut is not listed below as it is not available yet. It’s Festive Friday Challenge time, and this round is a sketch. I do apologise for getting this up late, but it has been a very hectic week……month, actually. I must also say that I was quite ill when I made this card and I don’t think I should do that again! LOL! 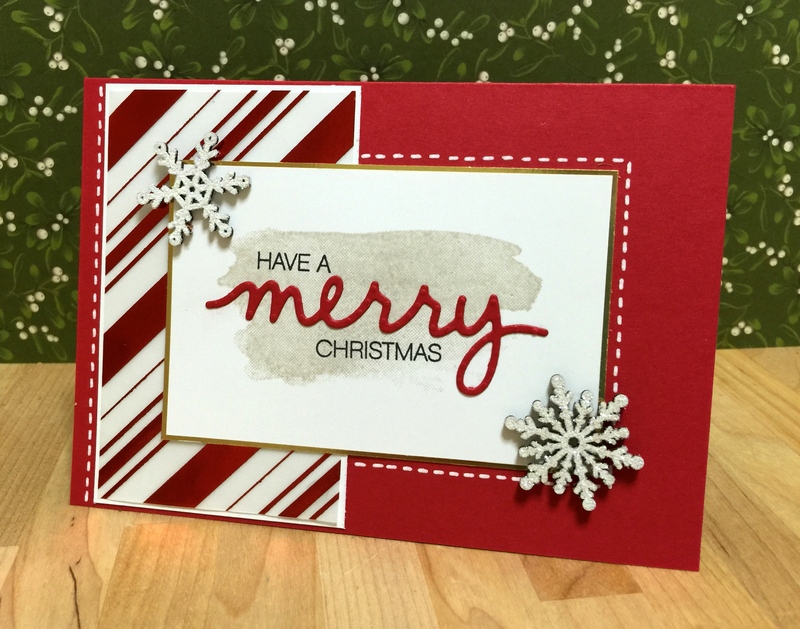 I used the Letter’s to Santa DSP quite heavily and matched it with the Merry and Type stamp set. I dyed my hemp twine with Early Espresso ink. 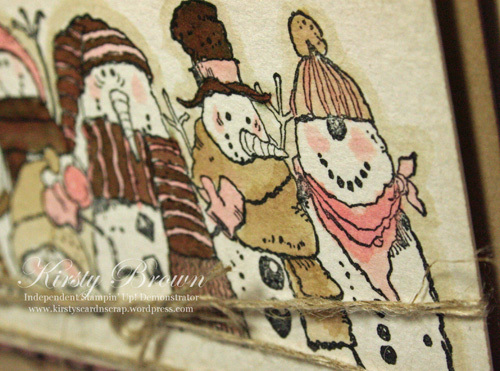 I wanted this to look a little more vintage and I used the distressing kit with the Tea Stain ink in it. 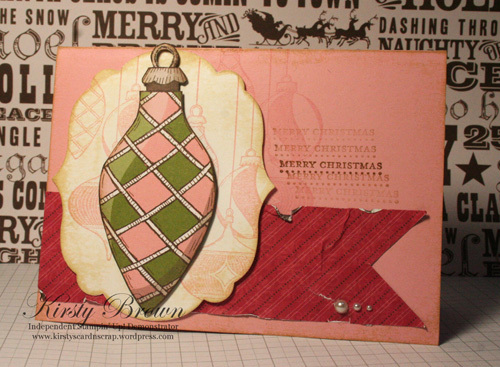 I rubbed it over all pieces of cardstock using the rubber stamp block in the kit. 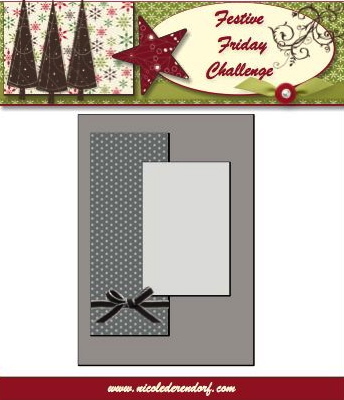 Don’t forget to head over to the Festive Friday Challenge blog and play along. I would love to see what you create with this sketch. 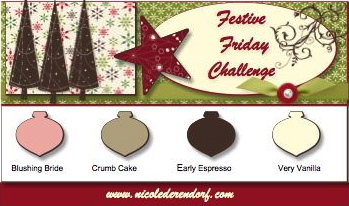 It’s time again for a Festive Friday Challenge and this week it is a Colour Challenge. 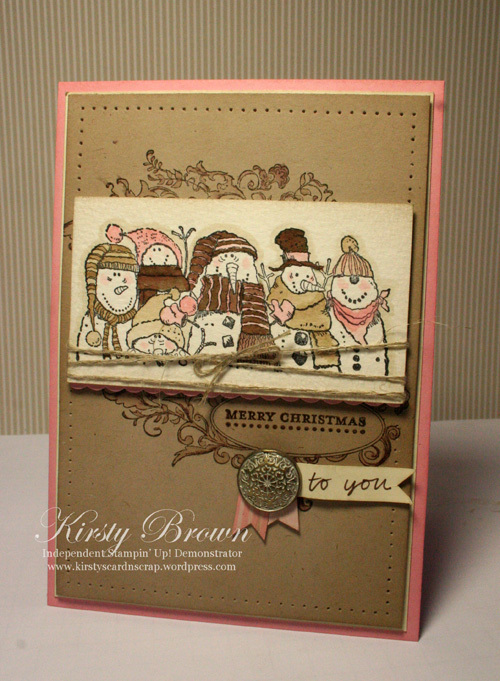 I love these tones together and if I could make every card in these I would be a happy girl! LOL! I now have a love affair going with the Elizabeth stamp set. It’s not only great for the placement of the sentiment but also a good background element if stamped in the right places. I also love the two little banners underneath the vintage brad. They are a cute little element, but they are not too distracting that it draws your eye away from the main image. I hope you all have a chance to play along this week and share with us what you have created. 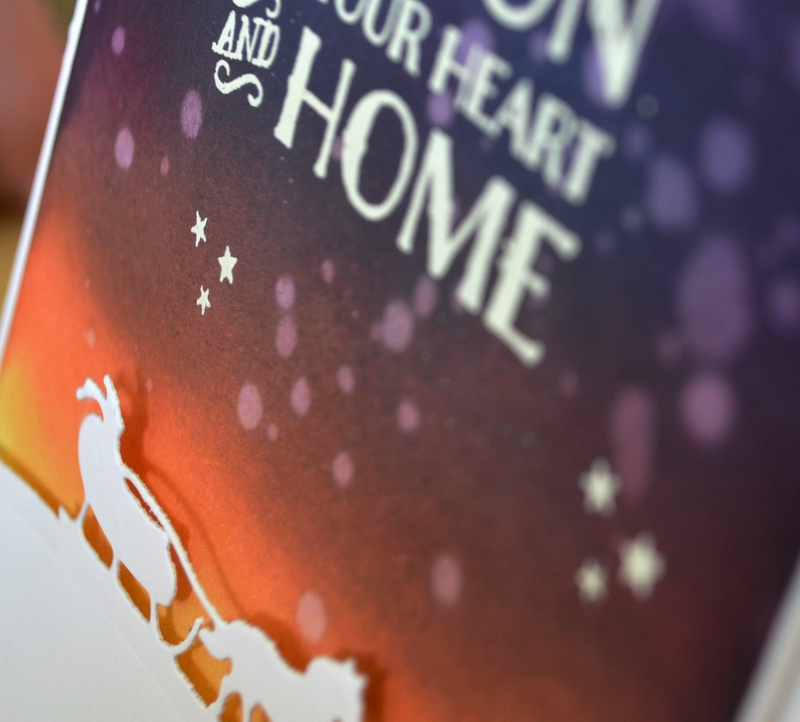 I have always loved the large Christmas Baubles in the Letters to Santa DSP pack, which are the same images as the stamp in Merry and Type but bigger. As you can see I stamped the image in the background. I used colours, Blushing Bride, Soft Suede, Old Olive, and Riding Hood Red. 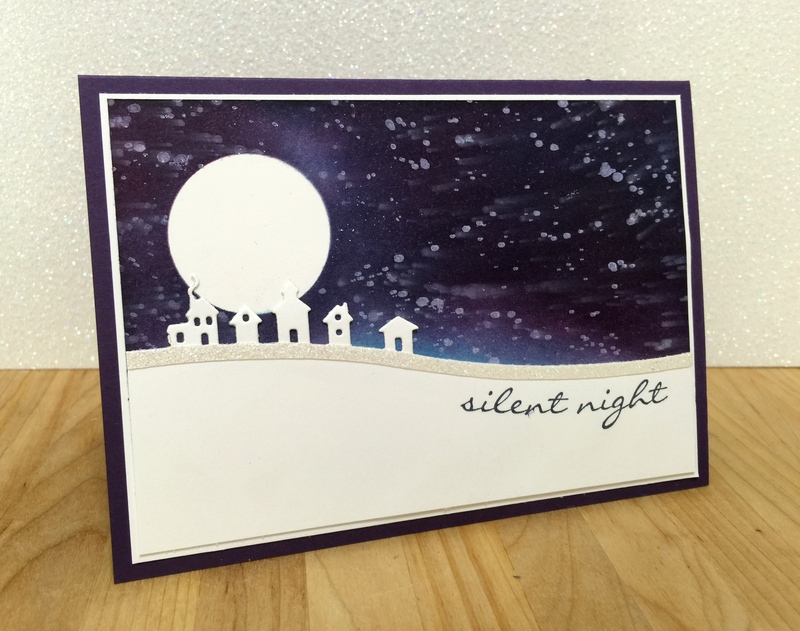 I also tried to keep this card simple with few layers and limited stamping. I used some simple tools to make the card come to life though. I used the distressing kit and inside that kit I used the sanding block and files on the DSP and the Tea Stain Ink on the card base and image panel. 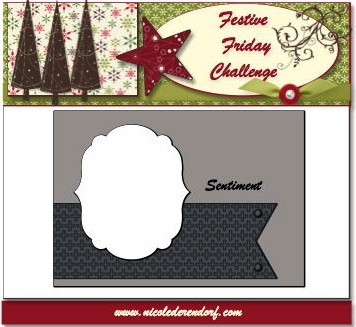 Don’t forget to link your creation to this challenge over at Nicole’s blog and I look forward to seeing them.